Cells are able to take up nutrients from the environment thanks to membrane-spanning transporter proteins. Different types of transporters are required to transport the wide range of nutrients that cells need, but this often comes at an energy cost because the cell must build up internal stores at higher concentrations than those found in the environment. Nevertheless, it’s worth the price because these nutrients are vital for survival. Passive transport is the movement of molecules from an area of a high concentration to an area of a lower concentration until equilibrium is reached. Imagine that you’re kayaking in a river and you stop paddling. Your kayak will travel in the direction of the current and slow to a stop once you reach a calm area. You don’t have to use your paddle. Similarly, passive transport doesn’t require energy from the cell. Passive diffusion is passage of some small, uncharged molecules, like CO2, O2, and H2O, through the membrane. Facilitated diffusion involves a carrier protein that allows passive transport of larger molecules, such as glycerol, across the membrane. Active transport is the movement of molecules against a concentration gradient and requires energy from the cell. In this case, you need to do a lot of paddling in your kayak if you want to go upstream! These types of transporters are usually specific for the molecule or ion they need to transport. This specificity helps the cell to maintain optimal levels of each molecule or ion. 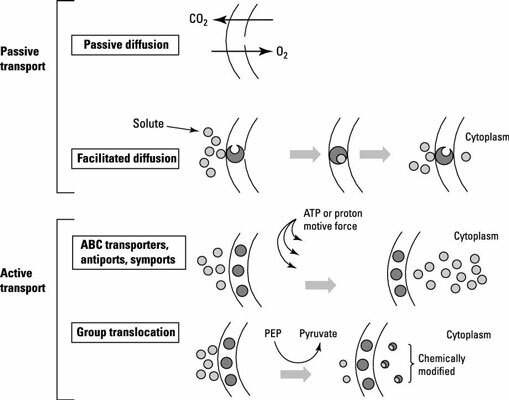 Antiports andsymports: Antiports and symports use energy from the proton motive force of the cell to drive transport molecules into the cell. As the names suggest, antiports transport a molecule and a proton in the opposite direction, whereas symports transport a molecule and a proton in the same direction. Group transport: Group transport involves enzymes that chemically modify a substrate as it is transported into the cell. Energy in the form of phosphoenolpyruvate (PEP) provides a phosphate group that is transferred to incoming sugars, such as glucose. ATP-binding cassette (ABC) transporters: ABC transporters have high specificity for the substrate they transport. Transport begins when a substrate-binding protein found either in the periplasm (the area between the inner and outer membranes) of Gram-negative bacteria or attached to the outside membrane of Gram-positive bacteria, binds with high affinity to its substrate. With the substrate in hand, it docks on a transporter that spans the membrane. Inside the cell, the transporter recruits two molecules of ATP for energy as the solute is transported across the membrane. Sometimes cells accumulate substances that interfere with their regular function. To get rid of these unwanted substances, protein transporters work as efflux pumps to send molecules outside the cell. Some efflux pumps are selective to the molecule they export, while others are able to export a variety of unrelated molecules. In both cases, efflux pumps must use energy (ATP). The types of toxins that a cell may export include dyes, detergents, host-derived antimicrobials, and antibiotics. Transport proteins allow flow between contents within a cell and the environment, but it’s important that the exchange of molecules is regulated — it’s a waste of energy to transport nutrients if they’re not needed. The cell makes transporters when it senses that it’s low in supply of a specific nutrient. Because transporters are selective for the substrate they transport, they help build that supply back up, and when their work is done, they’re no longer made.